1xPower adapter with 1.8 m wire. The DVD player enjoy 1 year of quality warranty. Strong compatible capability. Play in multiple formats: CD, DVD, CD-R/RW, DVD -R/+R, DVD+RW/-RW, VCD,SVCD; MP3/WMA/WAV, JPEG/BMP for pictures, NES(game format), MPEG2/AVI, TXT for e-book.Support USB and SD card. Also the Game port for game joysticks provides an extra entertainment of playing game. Sync DVD screen to TV: Connect DVD player to your TV with AV cable we provide, you can watch movies on the big TV screen. With 5 hours of high capacity built in battery at full electricity, a car charger with 1.8m wire, a reliable UL certificated charger with 1.8m wire, you can play it anywhere. Memory function: The portable DVD player can pick up from where it broke last time. Delicate appearance. 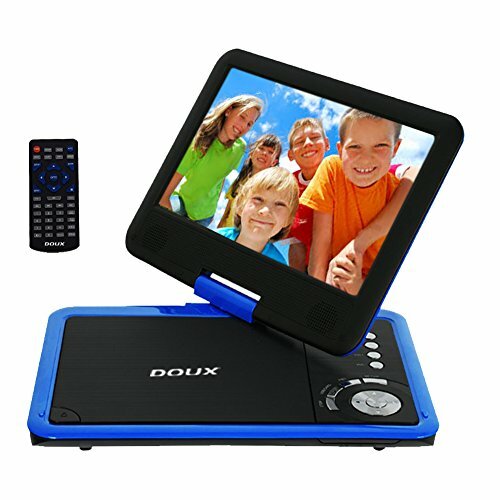 Needn't worry about fingerprint with dull polish technology.The key in the DVD and controller is clear.Easy to operate.It's very convenient to be carried on for travailing, camping and business trip.Any support you need you can contact with our customer service, we will help you out in 24 hours. If you have any questions about this product by DOUX, contact us by completing and submitting the form below. If you are looking for a specif part number, please include it with your message.